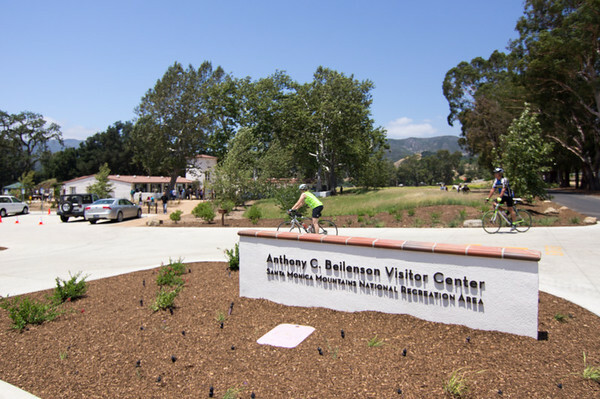 Saturday, June 9 2012, hundreds of people descended upon King Gillette Ranch for the grand opening of the Anthony C. Bielson Interagency Visitor Center. The new visitor center is in the heart of the Santa Monica Mountains near Las Virgenes and Mulholland Highway. It had been in Thousand Oaks for years, some distance from actual parkland. The Visitor Center will be managed jointly by the National Park Service, California State Parks, the Santa Monica Mountains Conservancy, and the Mountains Recreation and Conservation Authority. Several CORBA representatives and volunteers were on hand to enjoy the two-hour ceremony. We were also pleased to see many of the past and present land managers from each agency with whom CORBA has worked extensively. There were many elected officials, representatives of public agencies, conservation and open-space activists. Afterwards the public got their first hands-on with the center’s extensive new facility. The center is a converted and upgraded barn, and runs off solar energy. It houses some impressive educational displays, route planning, high-tech touch screen slide shows and a large relief map of the entire NRA. Kids seemed to love the interactive displays. There’s an extensive gift shop and staff eager and ready to help the public get the most out of a visit to the park. It’s the culmination of a decades long effort by activists, politicians and passionate lovers of the outdoors to protect and preserve the ranch from development. It now stands as a testament to that effort. During the extensive speeches, it became clear that a great many people contributed to this process and project in some way. From a dream to court battles, to acquisition, and now reality. And for all those involved and all of the public, it was a very welcomed day. The visitor center is on Mulholland Highway, just east of Las Virgenes Road. If you ever need to know anything about the Santa Monica Mountains, plan a trip or just learn about nature, it’s definitely worth a visit. More photos below the break.